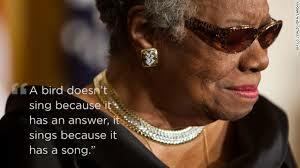 Yesterday I shed tears upon learning that Dr. Maya Angelou passed away. 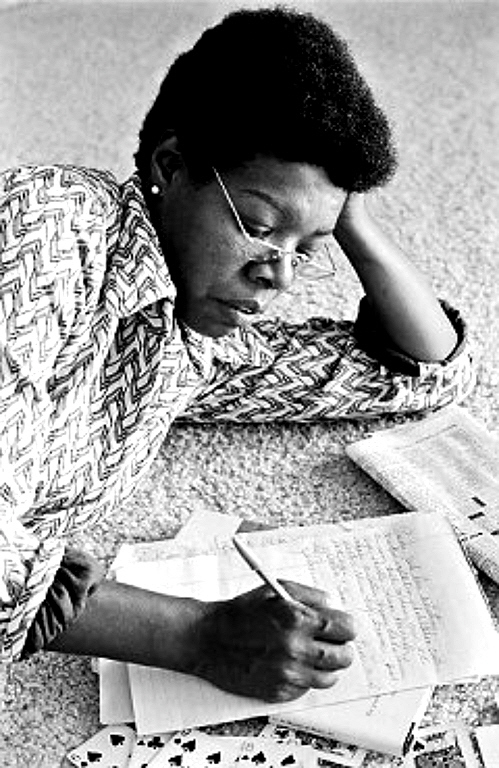 This legendary woman influenced my desire to become a writer. 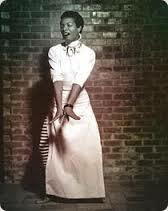 It was after reading I Know Why the Caged Bird Sings and Phenomenal Woman that something clicked inside of me. I thought, ‘If she can do it, I can do it.’ Here was someone who looked like me and came from humble beginnings, then went on to take the world by storm. I never had the pleasure of actually meeting Dr. Angelou, although I came close once and it is an experience I will never forget. In January of 2011, she came to a book signing at Barnes and Nobles in Dallas. This B&N was one of the larger ones with two huge floors and a cafe inside. The place was packed. Literally standing room only. 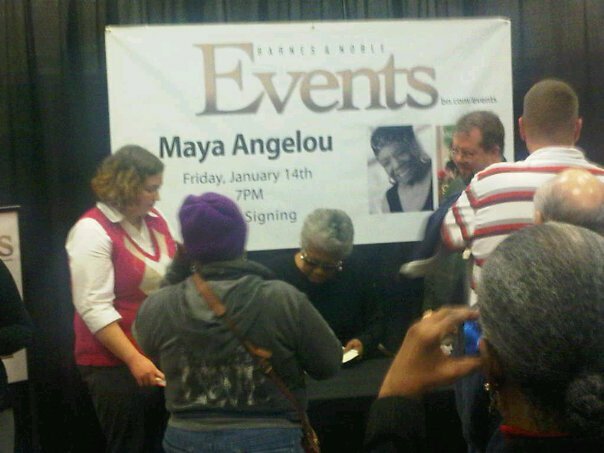 We were all there to meet Maya Angelou, and to hear her speak. I wish I had the words to describe how awesome it was to listen to her articulate in that special way she had. When she opened her mouth, even with all of those people there, including children, you could hear a pin drop. Everyone was in awe of her! She was so authentic. She wanted to stay and take pictures with everyone, but her health was failing even then. This great lady apologized profusely that she was not well enough to meet all of us individually. She then promised to sign all of our books and mail them to us. And she did. I was thrilled to get my signed copy of I Know Why the Caged Bird Sings. Reading books and poems by Maya Angelou is like sitting on the lap of your grandmother and listening as she gives you lessons on life and living. I found my own voice through her’s. She has made her transition but her words, which are her beautiful legacy, will live on. May you forever rest in peace, Ms. Maya. This is a touching poem dedicated to the abducted Nigerian girls. The girls have been missing since April 15th, but latest news indicates that US Troops may eventually intervene due to social media pressure, among other things. Never underestimate your power. Tweet or Facebook #bringbackourgirls to add your voice to thousands demanding world wide attention. Well there’s a first time for everything, and this is my first time going on a blog tour! I’m beyond flattered that fellow blogger Quanie Miller of Quanietalkswriting.com thought to tag me. Out of all the fabulous bloggers in her circle, she chose lil’ ole’ me 😀 I know you can’t see me, but I’m all aglow with pride. Be sure to check out her blog and her hilarious novel It Ain’t Easy Being Jazzy. I’m currently working through extensive content editing on my yet unsigned debut novel. It’s a beast, and I’m starting to think it’ll need to be broken up into a series. 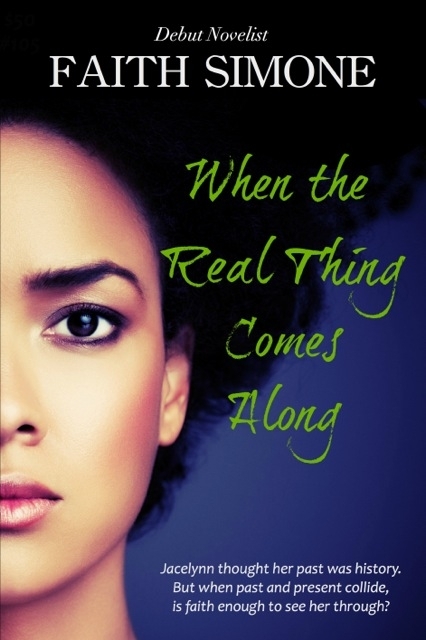 Its working title is When the Real Thing Comes Along and it’s a realistic contemporary Christian novel. My protagonist’s ultimate goal is to let go of past emotional trauma and open her heart to the possibility of falling in love again. It sounds a little heavy, and at times it is, but it’s also full of laughs. My goal for anyone that reads it is for them to walk away asking themselves some tough questions about love, relationships and who they are in God. I’ve got two other novels brewing in my head, but I won’t let myself start to work on them until I get WTRTCA out. My next protagonist is getting a little antsy, so I need get to writing her story soon! Mmmhhhh…Christian fiction has really evolved over the last few years, primarily due to the self publishing revolution. Back in the day, major publishing houses had specific rigid guidelines regarding the main character’s morality and actions. It made sense, because most readers of faith-based literature chose to read that genre in an effort to avoid potentially offensive material. The only problem was that often the books ended up being totally unrealistic. So I guess this is my round about way of saying that my work differs from others in the Christian genre by attempting to keep it as real as possible. I’m a Christian and I’ve made mistakes and stupid decisions. The characters in my stories tend to do the same. But guess what? God still loves us, flaws and all. I hope that’s what stands out as the main message in everything I write. I think I sort of delved into that with the previous question. But I’ll take a moment to also add that Christian fiction is not my ONLY genre. It’s the genre of my current work in progress. My goal is to blur the lines between genres. Eventually, I hope my entire body of work spans various ethnicities, races, faith practices, lifestyles, etc. All people are fascinating to me, and I think everyone has a story to tell. 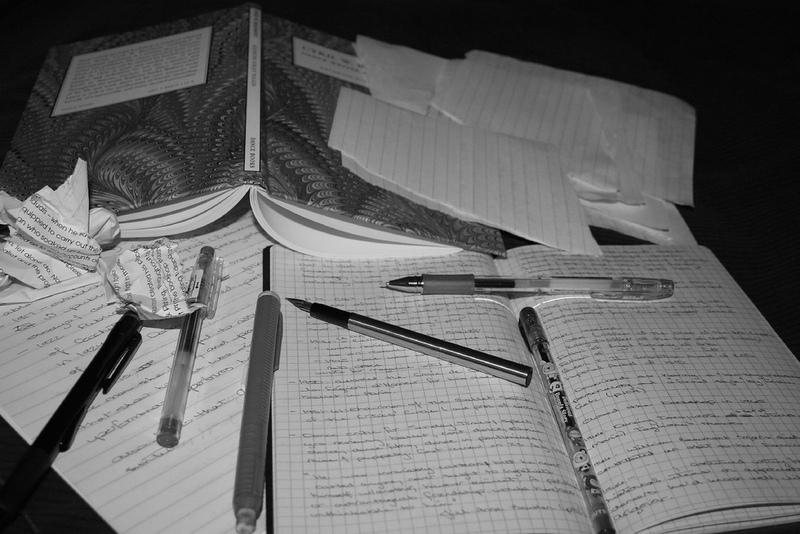 I write because I have something to say. I write because, through out my life, books have been my saving grace. If I can offer someone else a needed escape or the opportunity to look at the world through a different set of lenses, I count it a privilege. What process? You mean people actually have a thought out method to the madness of writing? Stories pop in and out of my head for months, sometimes years, before I actually write them down. I know I need to write it when it won’t let me go! I’m absent-minded, but if I sit down and play out a scene or short story in my mind, I can re-create it eons later on paper. I don’t want to sound totally out there, but it’s almost like the stories I tell are memories of lives I never lived, but that need to be shared. When I decide to finally write the story out, I’m character driven. I start it, and then they take over. It’s entertaining for me to see where they go. It’s also frustrating, but hey, that’s life. Who am I adding to the tour? As much as I’ve enjoyed talking about myself, it’s not all about me. I get to tag someone I think should join us on this tour. Ann Fields is the wonderful author of Fuller’s Curse–a psychological horror story with super natural elements that will leave you breathless! She’s also blogging at annfields.com. I hope you all take a moment to check out Ann’s space in the blogosphere! Would they be able to see it? Would they be able to tell? 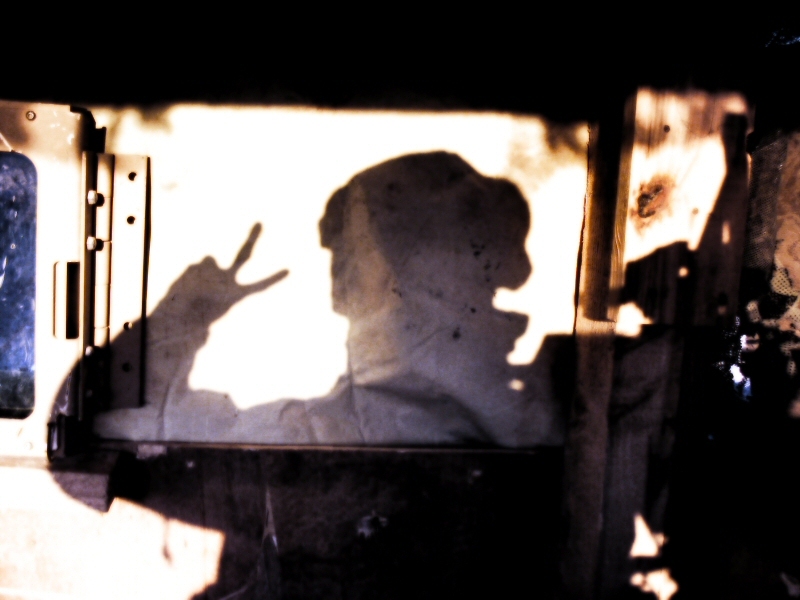 Sometimes he felt that it would be easier if his scars were visible. If he walked with a limp or was missing a limb, maybe then people would understand when he moved a little slower, or needed a helping hand. Instead, he looked like any other young man attending his first day of college. Unless you looked a little closer. Unless you were the type of person that looked with your heart. Then you might notice the quick flash of hesitation when another student extends a hand in greeting. Or you might sense the anxiety building as people crowd the door in casual conversation before the start of class. You might understand why he would suddenly yell at everyone to sit down, then turn red in the face after he realizes what he’s done. It doesn’t matter that they are blocking the only way in and out. This wasn’t there. This was here. He tells himself to relax. An impossibility in a crowded room, he knows. But he repeats it to himself anyway. Relax. The teacher walks in and he feels the panic subsiding as the other students choose seats and stop the chatter. The door is free and clear now. Relax. He lets his back rest against the wall behind him and surveys the environment from his vantage point in the corner of the room. He automatically sizes up the biggest threats in the classroom, looks for potential weapons and reads body language for indication of attack. His heart races. Relax. He watches the teacher out of the corners of his eyes while giving the illusion of staring straight ahead. After all, he is still standing at attention. He senses the embarrassment of the other students. He can feel that they are unsure of how to respond to the unusual behavior of the man-child announcing himself as a soldier in the midst of poly sci 101. Relax. He knows that he should probably sit down now. But he doesn’t have permission. He needs permission! And he can sit. And he can breathe. Relax. He is here now. He was there, so that they could all be here now. Thank You to Our Troops for Their Service! I found this cute little game on Life of a Female Bibliophile and decided to participate in a book tag. If you want to play along, just answer the questions in the comments below or post them on your blog. Don’t forget to link back to me! Most of the time, it’s just enough. I’m going to read the first few pages anyway before I decide whether I’m going to read the whole book. N – New book: What form do you want it in? Be honest: Audiobook, eBook, Paperback, or Hardcover? I love the feel and smell of hardcover books. Where do they do that at? Uh, no I do not write in my books. Unless you count putting my name on the inside flap. I come from a family of book lovers and you’d be surprised how many arguments I’ve had with them about who a book belongs to. I – In your best voice, read for us your favorite 1st sentence from a book. It was the best of times, it was the worst of times…Sike. I haven’t read A Tale of Two Cities but I’ve always liked that opening. Don’t judge me, it’s on my to be read list. D – Does it matter to you whether the author is male or female when you’re deciding on a book? What if you’re unsure of the author’s gender? I’m not particular. There are times when I specifically seek out books written by male authors. I typically read a lot of chick lit and women’s fiction, so sometimes I just want to add some testosterone to my reading list. I used to do that all the time as a kid, but now I don’t. I’ve learned patience, and appreciate the journey the writer wants to take the reader on. So I’m content to let them drive! O – Organized bookshelves or Outrageous bookshelves? Are all the books on the shelf? Then, hey, I call it organized! U – Under oath: have you ever bought a book based on the cover alone? T – Take it outside to read, or stay in? I read any and everywhere. If there’s enough light to see by, I’m good. 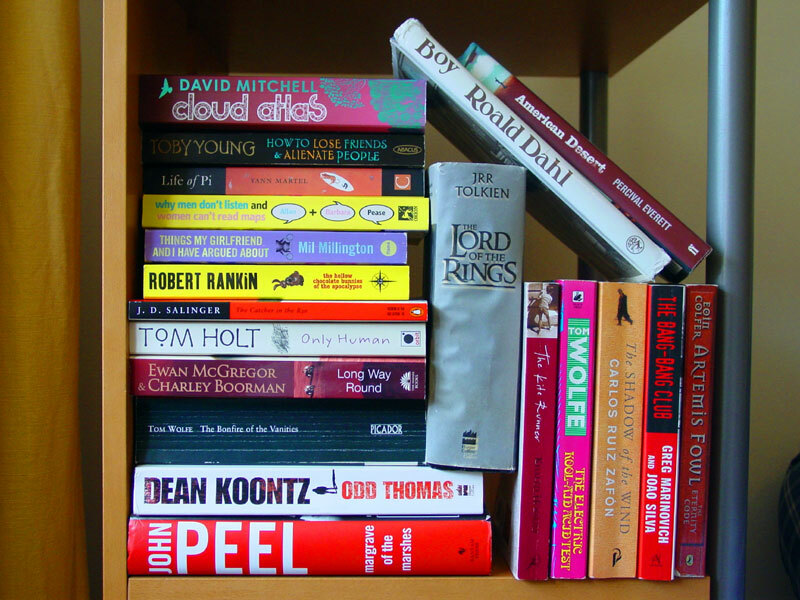 Check out Life of a Female Bibliophile here! Writers are peculiar people. This is a commonly known fact. But how do you know when you’re strange because you’re a writer, or when you’re just plain strange? Allow me to help you out. You happily spend hours reading books or blogs about writing, then complain that you never seem to have enough time to write. You automatically think of writing whenever anyone even mentions the word passion, because what else could they possibly be talking about? You get an absurd amount of pleasure when you spell check a document and see the “No Errors Found” message. You’ve practiced your special book signing signature a hundred times, then pretend to act surprised every time a reader asks you to sign their copy of your book. Google is your absolute best friend. Literally. You just took a moment to think about whether I used the word ‘literally’ correctly. You spend hours surfing the web aimlessly and call it researching. You’ve been interviewed by Oprah. It may have only been in your head, but you were absolutely brilliant. You have to make a conscious effort not to mentally edit any book that you read. You’ve wondered if any of your works will be published posthumously. You know what posthumously means. Your favorite pastime at any event is finding a good spot to observe everything that’s occurring without being noticed. This causes enormous anxiety when the event at hand is about YOU. You’ve mastered the art of balancing the fine line between intense observation and downright stalking. You’re asked to describe someone and after stating their eye color, approximate height and weight, etc. you can’t help but to add something like, “She walked hesitantly, almost as if she expected disaster to pounce on her with each step.” Yeah, that helps. You’ve questioned your sanity, mostly because you DO hear voices and they DO tell you what to do. No matter that they’re characters in your latest work in progress. Solitude is your preferred state of being, and you find people who thrive in the presence of others truly baffling. You use words like baffling. You’ve laughed and nodded your head after reading at least one of the things on this list. You’re going to share this list on one of your social media platforms, because others need to know. Maybe then they won’t look at you so strangely all the time. I’m embracing the strange habits that come along with being a writer, what about you? Tell me about your unusual writer characteristics below! Monday Pick Me Up: #Kindle Freebies! Monday fun day! Said no one. Ever. But after you’ve had a cup (or two) of coffee, hopefully you’ll muster up enough enthusiasm to take a glance at these e-books, all of which happen to currently be the best price ever: absolutely free! They’re all sitting in my little Kindle just waiting for me to get off work and snuggle up with them…it might be time for me to go on a date. But anyway, enjoy! Just click on the pictures to get yours via Amazon. The opening pages of Elin Hilderbrand’s touching and compelling new novel, the story of a woman who sets out to find love for those closest to her — before it’s too late.48-year-old Nantucketer Dabney Kimball Beech has always had a gift for matchmaking. Some call her ability mystical, while others – like her husband, celebrated economist John Boxmiller Beech, and her daughter, Agnes, who is clearly engaged to the wrong man – call it meddlesome, but there’s no arguing with her results: With 42 happy couples to her credit and all of them still together, Dabney has never been wrong about romance.Never, that is, except in the case of herself and Clendenin Hughes, the green-eyed boy who took her heart with him long ago when he left the island to pursue his dream of becoming a journalist. Now, after spending 27 years on the other side of the world, Clen is back on Nantucket, and Dabney has never felt so confused, or so alive.But when tragedy threatens her own second chance, Dabney must face the choices she’s made and share painful secrets with her family. Determined to make use of her gift before it’s too late, she sets out to find perfect matches for those she loves most. The Matchmaker is a heartbreaking story about losing and finding love, even as you’re running out of time. Kristine Branton co-owns a bakery with her mother and sister in the small town of Cooper Glenn. She’s working herself to a frazzle struggling to keep the family afloat, with little help from them. When Joe Lancaster moves back to town, Kristine literally drops into his arms and into his life—via a rickety ladder and an overly exuberant pit bull mix puppy. Joe soon acknowledges having feelings for Kristine, but unfortunately, he had dated her big sister Lori when they were in high school, and Lori still has feelings for him. Hardworking and hungry Bible school student Jane Adler mops up other people’s messes to make ends meet. There’s nothing wrong with honest hard work–until she finds the body in her bosses bed. Mmmhh, looking over these selections I see a pattern: murder and romance. A little disturbing, to say the least. But, let me know if you decide to check any of these books out!